To celebrate 20 years of DJing, I am excited to present to you my first ever DJ Album, KEYS. 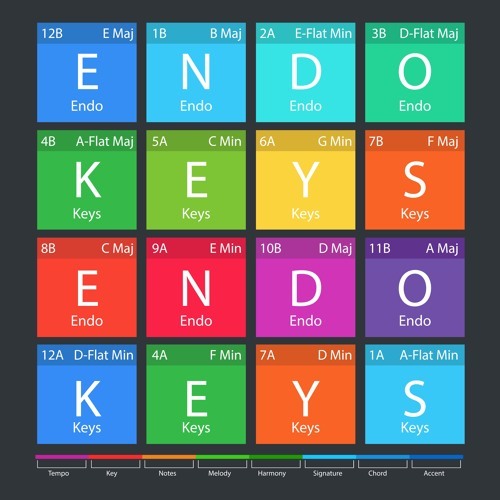 KEYS is a series of harmonic mixes that are mixed entirely in a single musical key. In the album there are 13 mixes; 12 Minor Keys and then 1 mix in all major keys. This project started as a massive music organization project where I color coded and rated 10,000 songs in my Traktor Collection, while testing each song out on the SubPac, but in the process of doing this, I was gathering my favorite songs in each key, and turned them into these special mixes that are a compilation of my favorite songs in each key. On top of this, every mix was performed live in my studio on Facebook Live. Each mix is a journey into the true vibe of a musical key. How does each key make you feel? The mixes were “arranged” in an algorithmic and systematic approach where there is a sort of “formula” to each mix based on energy level (rating) and vibe (color). Can you crack the code? On top of being a harmonic journey which explores the true vibe of each key signature, it is also a great tool for producers and musicians since you can jam out in a single key for hours and come up with ideas for songs, and practice your chord progressions, scales and write melodies. You can then take all of those ideas and turn them into your own creations. Throughout the next few months I’ll be releasing one mix a week. The mixes will be released in order of the circle of fifths, so the playlist will actually be a harmonic journey in order of compatible keys. Get ready to take a deep dive into the depths of my music collection, and get ready to explore the true essence and feeling of the different musical KEYS.